Master breeder keeps it humorous and simple in Grooming, Part 3. Cleaning teeth and trimming nails is not that hard. Doing it yourself preserves dental (and heart) health and prevents foot tendon damage. It dismays me as a dog-show judge to examine dogs that show dirty teeth and neglected toenails, yet it happens regularly, even in my breed, the German Shepherd Dog. Why Clean A Dog’s Teeth? Without proper dental care, tooth decay and gingivitis can lead to serious heart problems. In addition, teeth may recede into swollen gums with gingivitis, or they may even fall out by the time the dog is nine or ten years old. While it is true that dogs wear down or break off their teeth by about the time they will soon no longer need them, there is no excuse for ignoring the dog’s need for regular cleaning to the point that we cause him to reach that stage years before the natural consummation of his life. To rely on dry dog food to scrape tartar off the teeth is like exercising your jaw muscles by eating only corn flakes with milk. Dogs should be given the proper occasional bone, rawhide or other chewy. The best method is to give him a frozen (raw) chicken quarter once a week. For Toy breeds, a wing will do nicely. Just as you might nibble little bits off of a popsicle, the dog will gnaw through meat and bone together, little by little, and work it down to a tiny nubbin. No separation of bone from meat, as happens when cooking, and no splintering as you could get in a thawed or cooked piece. The gnawing-chewing action utilizes almost every tooth and really cleans them as no other method can do. It is just as good as scaling the teeth with a dental pick, but less work for you and more enjoyment for him. Done properly, cleaning his teeth at home will avoid the stress and expense of having the dog anestethized for cleaning and scaling away tartar. Unless you use this method, you should scale the teeth once a month and (depending on what food you give your dog and how fast tartar builds up), you might want to also brush them a couple times a month as well to keep them in good condition. The “brush” can be one of your used toothbrushes, or a rough cloth wrapped around your finger, with toothpaste applied. 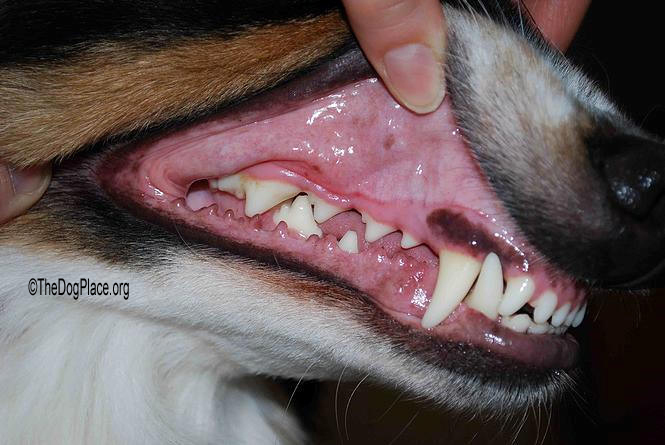 When the judge, vet, or friend looks at your dog’s teeth, the color brown should be as embarrassing to you as it would be on your child’s exposed underwear. If you don’t have a dental pick, you can use a short-handled, short-bladed screwdriver on a dog that hasn’t had his teeth cleaned in a while. Sit on the floor with the dog lying on his back, snugly supported by and locked in place between your legs. Start with the easiest tooth, the big canine. With almost all the tool hidden in your hand and just the smallest part of the blade showing, push the gum back a little and firmly push the hard tartar toward the tip of the tooth. If the finger of your other hand is there, when the tartar breaks loose, you’ll be able to prevent the blade from gouging into the tongue or gum of the opposite jaw. After you get practiced and the dog learns not to wiggle, use the sharp-pointed dental pick. Your dog will resist at first but not so much if you accustom him to being in that position for a good belly rub. Don’t try to do the whole mouth at once. Short sessions are best. Always, with each tooth, start underneath the normal edge of the gum and chip the plaque away. 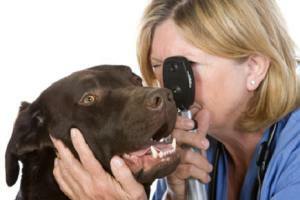 With just a minimum of practice, you can save big vet bills and use the vet only for things you cannot do. In the natural state, canines keep the nails worn down by running on rough ground and digging holes. When nails grow too long, they cause the toes to become deformed and can even cause deformities in the feet and “wrist” joints. Neglecting care of the dog’s claws or, as we non-veterinarians usually call them, the nails, can be expensive for the owner and costly for the dog. Every dog should become used to getting his nails trimmed every month or so depending on the surface he spends most of his time on. If it is carpet, you will need to clip his nails more often. Put it on your calendar. Make nail clipping a habit, along with heartworm preventative, teeth cleaning, combing, inspection of the coat and skin, etc. Many of these activities can and should be times of strengthening bonds, not just performing duties. A whetstone, a short-bladed, short-handled, and very sharp knife, plus a good nail clipper made for dogs are all you need. Find a shady spot outdoors with good indirect light, or a well-lighted area in the house where it will be easy to sweep up the trimmings. Use the same dog-between-legs, escape-proof posture of sitting on the ground that you used when scaling the teeth. Dogs tend to wiggle and complain at first, but eventually they’ll be willing to get the nails done if you keep your patience and use lots of praise whenever they lie still. The first digit on the front paw (erroneously called a “dewclaw”) doesn’t touch the ground except during full gallop, so it doesn’t wear down by itself the way the others can; you’ll have to cut that nail deeper or more often. All toenails contain a cushion-soft core called the “quick” (meaning “alive, having blood”) that is covered on top and sides by the hard chitin or keratin type material that enables the animal to scratch, dig, fight, or get good traction. This hard shell grows in a downward curve resembling a parrot beak, and where it obviously hooks past the flat or “level” portion of the quick underneath, is where you want to cut with the clipper. However, the horny part which is thickest on the dorsal surface, continues to wrap around on the sides of the nail (although thinner there) and, if not properly maintained, tends to grow together and enclose the softer sole. And with it, dirt and other junk you don’t want to be there. The best way to handle the toe nail that has been neglected is to snip off the “beak”, then with your frequently-sharpened little knife, pare the thinner horn from the plantar area (bottom) and sides, a little sliver at a time, taking care not to slice into the corium (core, or quick). Use a sawing motion, but toward the centerline of the nail, otherwise it will be much more uncomfortable if you cut and peel away from the center. Then you can better see the remainder of the beak, and cut another section of that off. The first digit or “dewclaw” should be especially well manicured, and even smoothed with a sapphire file or emery board, because the dog uses this claw to scratch his muzzle, clean his teeth or muzzle, and even get foreign material away from his eye, and you don’t want a sharp or ragged edge on that one. The quick is rich in blood vessels and nerve endings, so if you cut it, the dog will probably protest and bleed for a while. That is another good reason for doing this job outdoors. You can use styptic powder (from the drugstore) or flour to help stanch the flow but it’s easier to just wrap that nail in a piece of paper towel and go on to the other nails. If it’s still bleeding when you release the dog, let him run around normally until it stops. If it doesn’t stop soon, have him check for von Willibrand’s disease. vWD is a bleeding disease people have too. The other potentially uncomfortable part of the operation is the pull you exert on the nail, so make sure the knife is kept sharp to cut easily in a twisting, carving motion. After having used the paring knife, you will find that you did not cut as much of the surplus nail off as you had thought, so carefully use the clipper again and trim the toenail closer to the quick, especially on the front and on the side edge right next to it. Of course, you can use an electric tool (called a nail grinder) to trim toe nails but my approach requires merely tools you can carry in a pocket or purse (unless you are boarding an aircraft). 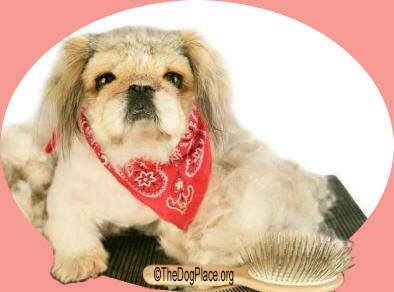 In Grooming The Haircoat and Bathing, Cleaning Ears, Age, Body Odor of this series, I offer the simple, common-sense, economical, and convenient way to groom dogs for health and livability. 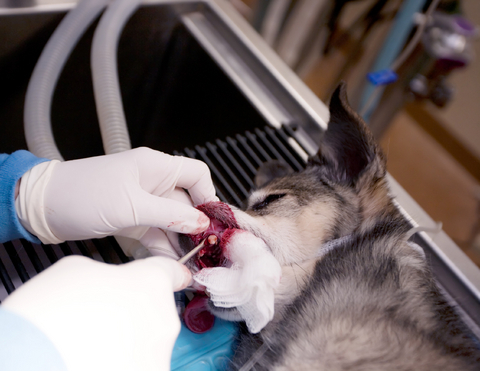 Learn Why Dental Disease Is Dangerous and can lead to heart problems in your dog. Video Theater makes dog care information easy with this FOUR-VIDEO collection: Teeth Cleaning without anesthesia, the importance of bones and American-made raw-hide, Scaling and Polishing those pearly whites and more.